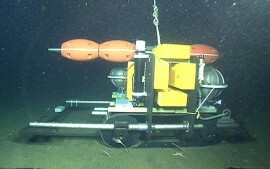 The benthic rover during tests of the drive mechanism at about 3,300 feet depth in 2006. The rover is headed to the left; the bare poles on its front will hold sensitive respirometers when the vehicle is connected to MARS. Image ©2006 MBARI. The rover also has two optical/acoustic scanners that detect active chlorophyll and animals like worms buried up to 4 inches in the sediment. These two pieces of information help to fine-tune the respirometry measurements and to determine how quickly sediment arrives. Diagram: Ken Smith, MBARI. At the MARS site 891 m (nearly 3,000 feet) below the surface, it’s pitch dark. With no light around, there are no plants making food. So where do all the animals – the brittle stars, clams, rat-tails, lingcods, and rockfish, to name a few – come from? And what are they eating? The bottom of the food web here is the soft blizzard of marine snow – dead organic matter – drifting down from the productive waters above. Small sea-bottom (benthic) creatures eat the marine snow, fatten up, and become food for larger invertebrates and fish. To measure metabolic activity in the sediment, twin respirometry chambers isolate samples of seafloor for 3 days at a time. Agitators stir up the sediment while sensors record oxygen levels. Diagram: Ken Smith, MBARI. This deep-sea dinner party is one of the last remaining mysteries of the carbon cycle. Scientists know how carbon travels around most of the world, including how living things build their bodies with it and how carbon returns to the earth, air, and ocean – in ways such as decomposition or the burning of fossil fuels. But beyond about 500 m (1,600 feet) deep in the ocean, scientists have only a fuzzy understanding of supply and demand for carbon. At sea bottom, they’re not even sure if the supply (from sources such as marine snow) balances the demand (from all the benthic organisms). 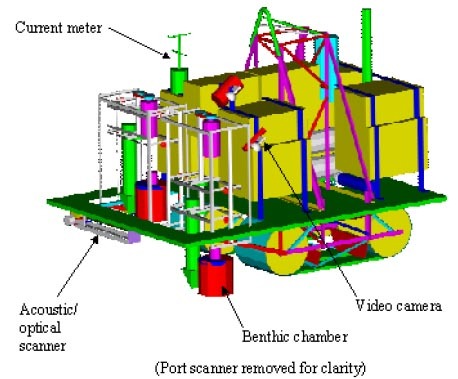 The benthic rover is designed to put some precise numbers on these processes. The rover is a mobile physiology lab. In a series of 3-day experiments, the rover measures how much oxygen seafloor animals are using. 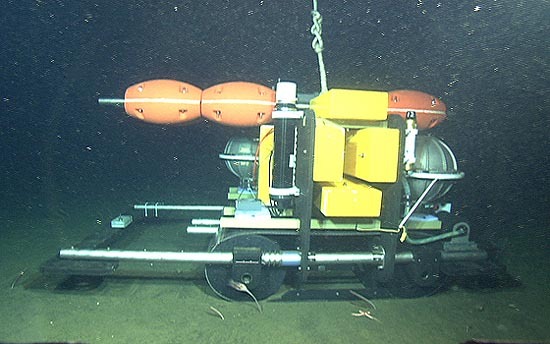 Precise motors lower two 30-cm-wide (12-inch) sample chambers into the sediment, where probes record oxygen levels. Two acoustic scanners use ultrasound (in 4-MHz pulses) to look 10 cm (4 inches) deep into the sediment for large animals like worms. Measuring oxygen consumption helps scientists calculate the seafloor’s demand for carbon. To measure the supply, the rover uses fluorescent scanners. 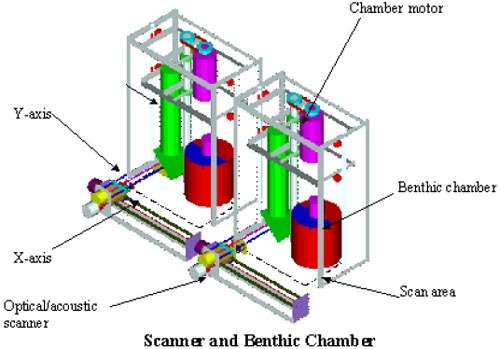 The scanners detect still-active chlorophyll in plant cells, a sign that the cells have only recently settled out from sunlit surface waters. For each experiment, the rover camps out at a single location for 3 days, then moves about 5 m (15 feet) to begin another sample. Before moving, the rover consults a current meter and waits until the current shifts so that its next predecided study location lies upstream. This patient approach allows the rover to keep from stirring up sediment into the area it is about to measure. By the end of 50 measurements, it will have stayed underwater for six to nine months and moved a total distance of about one and a half football fields. The rover is about the size of a riding lawnmower. It drives across the soft seafloor on caterpillar treads, which distribute the rover’s weight, grip better, and make less impact on the bottom than wheels. Although the rover weighs more than a ton in air, buoyant foam panels reduce that to 45 kg (100 pounds) in water. For the rover to function for up to a year at its maximum depth of 6,000 m (3.7 miles), it is made entirely of titanium and plastic. To understand carbon cycling in the deep ocean, scientists need rovers that work on their own in much deeper, more remote waters than at MARS. As MBARI engineers tackle these stiff design requirements, MARS lets them work on one problem at a time. With a constant data link to shore, engineers can test the drive mechanisms before they have perfected the automatic steering programs. They can also test sensor accuracy before the instrument goes down on a year-long stay. If problems crop up, the R/V Rachel Carson and ROV Ventana can be on site to fix things in less than two hours.